I love sending my Christmas wishes to friends and family during the Holidays. But ya know, for me taking care of my little children alone basically consumes all time and energy, add holiday parties+gift shopping +Christmas traditions (ok, maybe I’m not that mom with many cutsie christmas activities but the ONE we have takes time too!) +cold weather crankies (agh, the gloomy, winter is not my friend, I need me some sun!) and my good intentions rarely come to fruition. 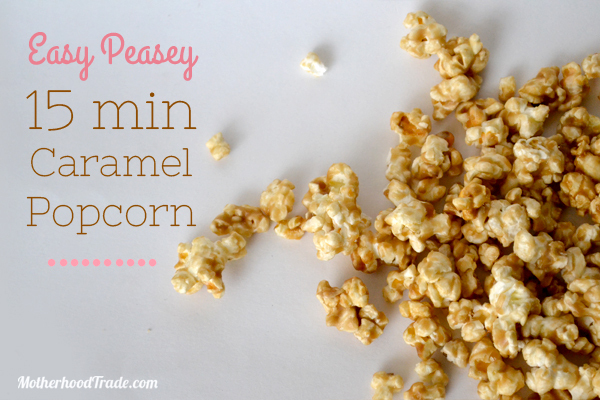 Luckily, earlier this year I come across this super yummy and too simple to be true (oh, but it’s true) microwave caramel popcorn recipe. 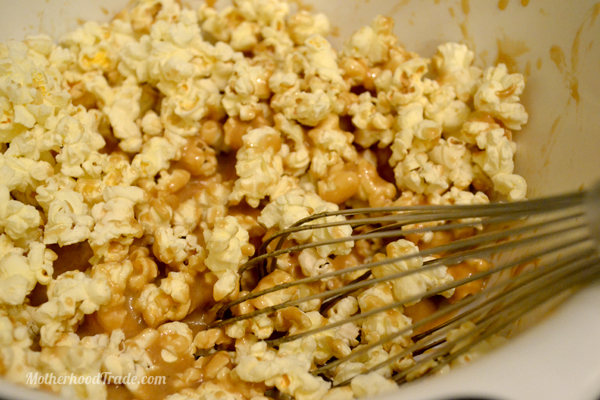 I was trying to make caramel popcorn one day but the top google search for caramel popcorn took a whole stinkin’ hour and half to make, (I must have been in quite a hurry to consume fatty sugary goodness as quick as possible) so I kept looking. 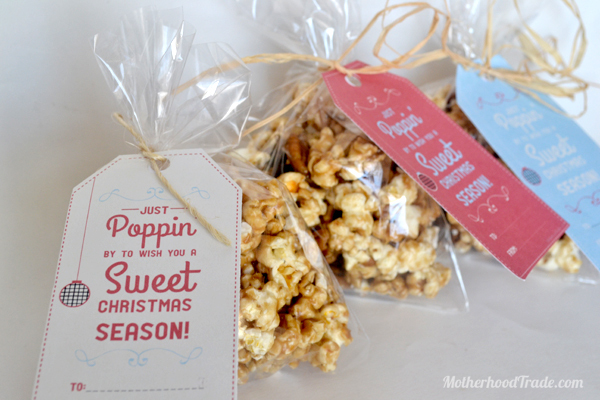 I googled microwave caramel popcorn actually hoping to use my already buttered microwave popcorn bags I had but instead I found this recipe. 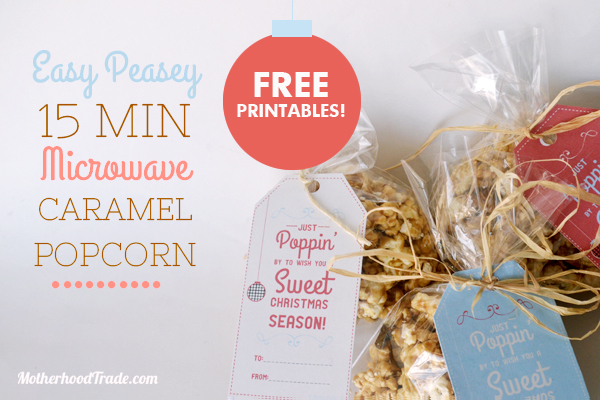 15 whole minutes to a delicious caramel popcorn, you won’t even believe it was made in the microwave! 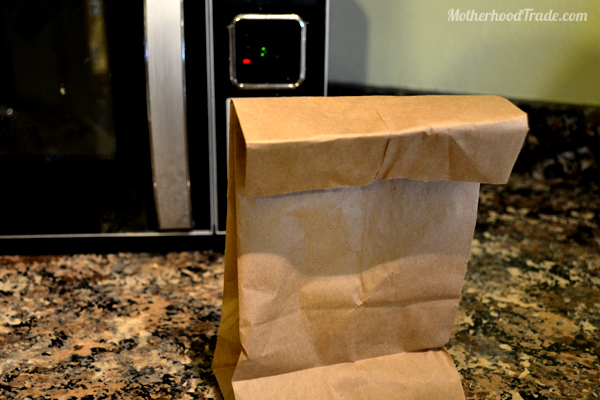 It does call for air popped popcorn but one of the most wonderful tricks of the trade I have ever learned is that you can actually pop popcorn kernels in a brown paper sack in the microwave. So the version I have for yous can be made the microwave entirely. Woot. I’ve experiment quite a bit before to get the right amount of popcorn kernels and microwave time to suit my microwave and get the most popped kernels without burning them. Yes, many times my OCD attempts to be ‘efficient’ ends up costing me triple the time but now that I’ve got it right enough times, it is that much quicker, right? So I have found 1/4 a cup of kernels in a brown paper sack does a splendid job. Then microwaved for 2 minutes works really well (listen for your kernels when you do yours, all microwaves differ if the time between popped kernels slows down to 2-3 between pops, get it out) Make sure you roll up your bag a bit like so. 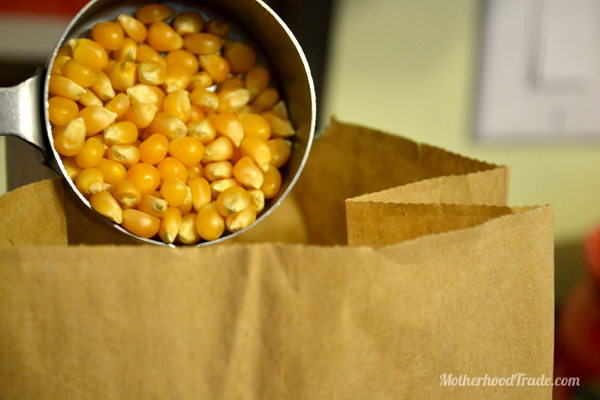 Make two-three bags depending on how rich you want your popcorn. This is a trick I learned as I experimented: shake the bags of popped corn so the unpopped kernels settle to the bottom, you’ll see why. Leave them in their bags! Meanwhile dump 1 cup brown sugar, one stick of margarine (I used butter), 1/4 cup corn syrup, 1/4 teaspoon salt, 1 teaspoon vanilla extract in a bowl and stick it in the microwave for 3 min. Bring it out, stir and put it back in microwave for another 1.5 minutes. Pull it out and stir in 1/2 teaspoon of baking soda, it will fizz up a bit. I know, weird ingredient but I like to think it is the magic touch, I think it gives it a slightly crisp crunch! Now, instead of dumping the popcorn straight from the bag into the bowl of melted goop, GRAB the popcorn fistfuls at a time from the bags into your bowl. Since I had you shake the kernels to the bottom, you won’t get unpopped kernels in your popcorn!! Hurray. Mix as you go. But don’t use a whisk like I did. I soon had to grab a spatula after I took this picture. Put back in microwave for another 1 minute and continue stirring until coated as desired. Let cool. Enjoy! One time I resorted to this recipe when I needed some quick potluck item. 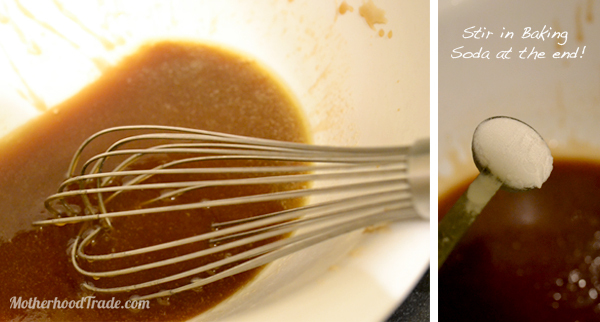 I realized only after I had started the recipe that I didn’t even have brown sugar. I used white sugar, I also added nuts and raisins to try to offset all that sugar since the potluck was with peeps in my exercise classes. I already felt funny bringing caramel popcorn to a lunch potluck with people who all, of course, brought ‘healthy foods’, but the fact that I didn’t even know if all my modification even worked made me not want to announce my offering in anyway. Eventually the ladies found the culprit food and I don’t know if it was because there was nothing with as much sugar and butter in sight but those females devoured it like there was no tomorrow! They couldn’t stop commenting on how good it was. So there you have it. White sugar works (favorite combo, half white, half brown sugar) and now it is common for me to add raisins/dried cranberries and nuts to at least half of the batch since, quite honestly I think is an awesome team of yum. In a microwave safe bowl combine sugar, butter, corn syrup, salt and vanilla. Remove from microwave and stir. Return to Microwave for another 1.5 minutes. 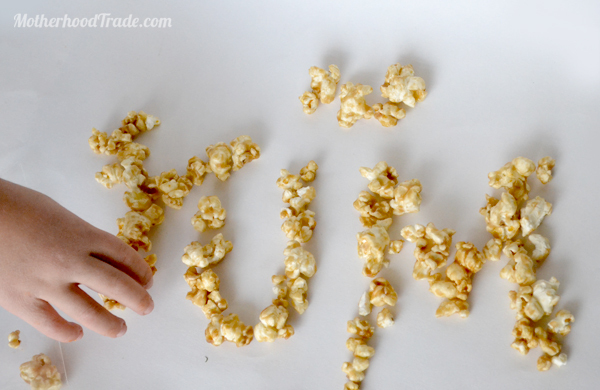 Grab popcorn from bags fistfuls at a time into bowl of caramel sauce, stir and with coat caramel. Stir in nuts and raisins/craisin if desired. Put back in microwave for another 1 minute and continue stirring until coated as desired. Let cool. Enjoy! Quick and easy bean and corn with vinaigrette salad for potluck, gatherings and dinners. Mix all ingredient together except for avocados. Mix them in very last so they don’t end up as smashed smeared green from all the mixing. The flavor might be a bit sharp at first from the vinegar but the more is sits (in fridge if several hours) the better the flavors will blend. Yes, it is better if you don’t run on last minute frenzys like me, but if you do…hey, it totally still works great! Look it at this way…my last minute habits have created some groovy improvised recipes. Serve alone or with chips…or if you are like me and don’t usually have chips on hand but find flour tortillas, brush with olive oil and sprinkle salt, slice them up and stick them in your oven for a few minutes to crisp up. YUMMMMM. Mix all ingredient together except for avocados. Mix them in very last so they don’t end up as smashed smeared green from all the mixing. The flavor might be a bit sharp at first from the vinegar but the more is sits (in fridge if several hours) the better the flavors will blend. Yes, it is better if you don’t run on last minute frenzys like me, but if you do…hey, it totally still works great!